Studies over the years (such as this one) have shown repeatedly that children whose parents read to them have larger vocabularies than children who aren’t regularly exposed to the written word. That message seems to be getting through: A new study from the Pew Research Center’s Internet & American Life Project found that half of all parents with children under 12 say they read to them every day; another 26 percent say they read to their child a few times a week. 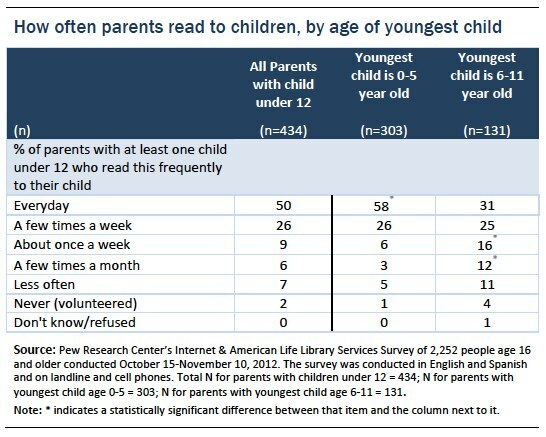 As one might expect, parents are more likely to read to children 5 and younger than to older kids — most of whom, presumably, can read on their own. Mothers are more likely than fathers to read to their child every day (55% vs. 45%) as are parents under 40 (55% vs. 43%), those with incomes over $50,000 (60% vs. 42%) and those with at least some college education (59% vs. 36%).